Business Risk Analysis for Excel focuses on five key areas of operating and financial risk - so that you can control them before they become problems. Using the Markov estimated process for bad debt, Business Troubleshooter uses your financial history to estimate your future uncollected amounts saving you anxiety and surprises. The Business Risk Analysis for Excel earnings dilution module helps you understand implications of issuing securities, and alerts you to the legal issues involved. The business interruption module helps you see how much insurance you should carry to guard against disaster. Business Troubleshooter's liquidation module helps you understand the true purchase value of your company's equipment and prepaid expenses. 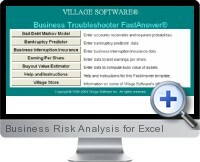 The Business Risk Analysis for Excel bankruptcy prediction module applies Altman's Z-Score formula to your financial data to detect potential bankruptcy, as much as two years in advance. Risks and pitfalls are part of business, and Business Troubleshooter makes management of these risks routine. Make sure you aren't caught by surprise when disaster strikes. Find out how much business interruption insurance your company really needs so that you're safe when business has to stop. Don't let your bad debts get out of control. Business Troubleshooter helps you plan sufficiently so that you can keep a handle on them. Predict bankruptcy as much as two years in advance with Altman's Z-Score analysis. You won't be caught flat-footed when you need to react fast. Over a dozen pages of content give you in-depth analyzes of your business problems. The Clear Data button makes creating another version simple. Just clear data, enter new data, and save. Village Software's unique print dialog box lets you print anything in the program with just two button clicks. Before you issue a security, make sure that it doesn't dilute the earnings per share. Business Troubleshooter tells you which securities will be diluted and calculates the information necessary for financial disclosure. Detailed in-built help is always just a click away to give you tips on the easiest way to complete a task. Plan for buyouts, or liquidations and profit the most. The buyout value estimator module gives you the negotiation edge because you'll know how much the business is really worth. Easy installation lets you jump in and analyze data right away. For whom: Ideal for small business owners, investors, business students, MBAs, financial professionals, business analysts, and others. What it does: Asks for financial data and calculates risk and performance using the popular Markov's model. It also provides recommendations on insurance, bankruptcy, securities, and others. Designed by: CPAs and MBAs with dozens of years of business and financial consulting experience. Design is based on expert financial models followed by thousands of successful business and financial consultants. Additional Excel business solutions are categorized as Free Excel solutions and the most popular. Further solutions proposed for specific user requirements can be either found in the Excel Help Forum.